Violinists Natsuko Yoshimoto, James Cuddeford, violist Jeremy Williams and cellist Patrick Murphy ceased performing together as Grainger Quartet in 2009. Grainger Quartet, named after one of Australia’s most internationally respected composers Percy Grainger, was founded in 2006. The Quartet performed in Sydney, Melbourne, Adelaide and Brisbane and was appointed Artist Associate with the Hong Kong Sinfonietta. Grainger Quartet made their Hong Kong debut in November 2006 to a sell out audience at Hong Kong City Hall Theatre and returned a number of times during 2007. They performed their 2007 and 2008 seasons to both popular and critical acclaim. Grainger Quartet has been hailed by composers, audiences and music critics alike for its significant artistic partnerships, including the collaboration with international pianist Cristina Ortiz. The Quartet was committed to actively commissioning and premiering works by Australian composers, most recently Andrew Ford, Damien Ricketson, Roger Smalley and David Harris. Grainger Quartet was honoured to partner with the Australian National Museum to present a series of performances using the AE Smith instruments from the museum’s collection. In 2007 this resulted in a live broadcast by ABC Classic FM in Sydney, and in 2008 their performance of works by Haydn, Schubert and Harris at the Canberra International Music Festival was a unique highlight. The Quartet performed in many major Australian Festivals including the Canberra International Music Festival, Aurora Festival, Camden Haven and Bangalow Festivals. The Quartet received support from the Australia Council for the Arts to present their concert series Darkness and Light throughout Australia. 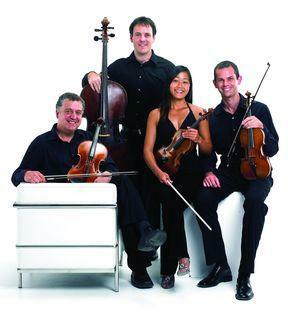 Grainger Quartet also formed the string section of the Sydney Soloists.Prior to 2006, as the Australian String Quartet (ASQ), the ensemble toured to Asia and Europe, performing at venues as diverse as Wigmore Hall, London; Konzerthaus, Berlin; Esplanade Theatres on the Bay, Singapore; and the Forbidden City, Beijing.